ClickSend Help Docs - I want to send a marketing campaign. Is opt-out required? All Categories ​>​ SMS ​>​ I want to send a marketing campaign. Is opt-out required? If your messages are considered as marketing messages, you need to provide a way for your customers to opt-out from future campaigns. The best option is to select the "From : A Shared Number” option and add the text “opt-out reply STOP” or something similar to the message. If you use your business name as the from/sender, the users won't be able to reply, therefore can't opt-out (see workaround below if you still want to use your business name). if the customer replies with STOP (case insensitive), we’ll automatically remove them from your contact list and add them to an “opted-out contact list” on your account. Can I use any other keywords to opt-out my customers? Yes. By default, the word 'STOP' (case insensitive) is used to indicate that the user wants to opt out. 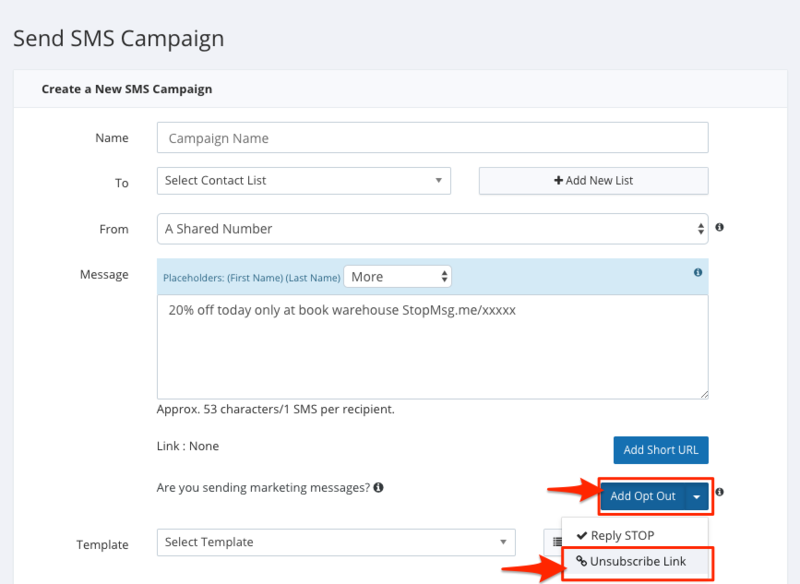 You can change it, or add extra opt-out words on the dashboard under SMS->Settings->Inbound SMS Settings. Just add a new rule and copy the same settings as the existing 'Stop' rule. We offer an unsubscribe link option. 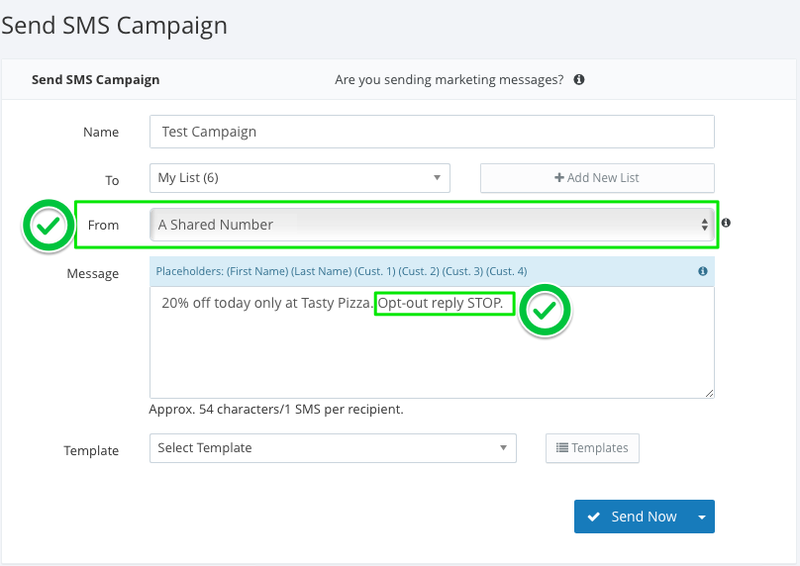 Instead of instructing a user to opt out of marketing messages by replying STOP, you can choose to add a link into your message. This link takes the form of StopMsg.me/xxxxx and is unique for every recipient. When a recipient visits this link, they are automatically added to your Opt Out list and removed from future marketing campaigns. This option allows you to adhere to message marketing requirements and provide an opt out feature for customers even when sending from a Business Name that customers cannot reply to. Please note that adding this link will impact the length of your message slightly, so be sure to factor this in. If you've chosen to send "From: Shared or Dedicated number"
The recipient can reply with the word STOP. As soon as this is received, ClickSend will remove the recipient from a list only until your next message is sent. This method only works if the country supports replies. Please contact us if you're not sure about the ClickSend reply coverage in your country. If you've chosen to send "From: Business name"
You may choose to have recipients opt-out by texting STOP to your phone directly. This method requires that the recipient be removed manually from the list within 5 business days. If you don't want to use your own number, you can purchase a dedicated number from us to use.